In an emergency, whether it be natural disaster or man made, it is more than a good idea to have a 72 hour kit. You and your family's lives may depend on your level of preparedness. Here are some areas you should consider while assembling your 72 hour kit. Container - Everything should be stored in one place in a container that is easy for you to grab. Consider using items like a backpack, a bucket, a carry-on luggage, or a plastic tote. Light - Include some kind of source of light such as flashlights, candles, lanterns, and light sticks. It is a good idea to get a self-charging flashlight to eliminate the risk of running out of power. Food and Water - Include food and water with long shelf life. It is also good to have items that will help you obtain drinkable water (water purification tablets, portable stove, stainless cups, etc.) Be sure to check the expiration dates periodically to keep them up to date. Weather Protection - Whether the climate is hot or cold, you must have items that will help you protect yourself from the elements. Include items like portable tents, emergency blankets, ponchos, a change of clothes, shoes, waterproof matches, kindling, etc. Communication - A simple radio can help you obtain information necessary to protect you and your family from potential harm. If the radio requires batteries keep in mind to include extra batteries. There are also radios that are rechargeable that would eliminate the risk of running out of power. First Aid and Medical Needs - A first aid kit is a must-have for all 72 hour kits, however, it is also important to include your personal prescription medication if you have any. If you require glasses, don't forget to include a pair of glasses as well. Cash in small bills - When the power goes out, it may be impossible to buy things using credit cards. Keep some cash in your 72 hour kit in small bills as well as some change. Sanitation and Personal Hygiene - Being able to meet your sanitation and hygiene needs in an emergency is not only a good idea, but it also helps you relieve the stress that always come with an emergency. Tooth brush, tooth paste, hand sanitizer, deodorant and other items are some of the items to be included in your 72 hour kit. 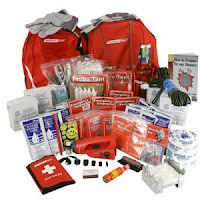 Other tools - It is also good to include some tools to help you survive an emergency. Among them are items like ropes, multi-function knife, duct tape, pry bar, and cell-phone chargers.